In all precious metals, steel and titanium. With a lazer welder on site virtually all repairs are possible including eye glasses. From replacing a setting and choosing a new stone for an existing ring to melting several old pieces to form a new design the possibilities are endless if you can think of it they can build it. Designs are sketched, models are carved, approved and original jewellery is created. Fine jewellery on display at Dube Designs encompasses every taste and budget. New designs are constantly arriving but the uniqueness and quality always remains. Certified Canadian diamonds, Canadian gold jewellery, watches, pearls and much more. First of its kind in Timmins! 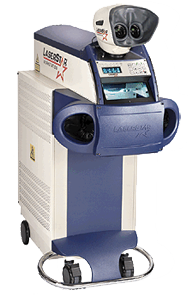 The Laser Star Welder uses state of the art technology, allowing for microwelding of all types of materials and items. From eye glass repair, stainless steel, titanium and other metals. Come in and see us about those repairs that you thought were impossible.